Age Tattoo - To AGE A TATTOO and make it look MORE REALISTIC or as if it is under the skin, choose a shade of Pancake compatible with skin and wipe over the top. Can be used over REEL Blue Aqua Sealer. Eliminate this step if the tattoo needs to look new or fresh. REEL CREATIONS has created REEL SAMPLE PACKETS to introduce make-up artists to our products. 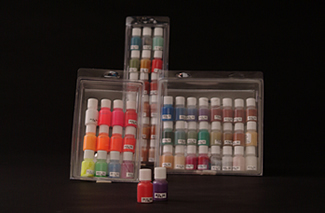 REEL SPECTRUM COLORS have 18 colors in 1/4 ounce bottles.